How many of you can say you've seen a god in concert before? Well, I have, and no, it wasn't Elvis. 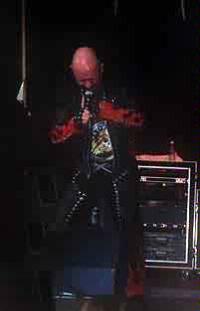 It was the God of Metal, the Saint in Leather, Rob Halford himself. Yes, the former lead vocalist of Judas Priest and Fight is back where he belongs, in a METAL band, after a disastrous side trip into the world of industrial techno-pop. Rob has got a lot to make up for, but his new solo album "Resurrection" is a pretty good start and getting the opening slot on tour with Iron Maiden and Queensryche doesn't hurt, either. That's where I caught him and his new band when the tour made a stop at Milwaukee's Marcus Amphitheater. After having a devil of a time finding parking, I managed to get to my seat about half way through what I think was the opening number, a surprising rendition of Fight's "Into the Pit'". One track in and it was already clear that Rob's voice has never been better. What a pleasure to hear this man scream again! 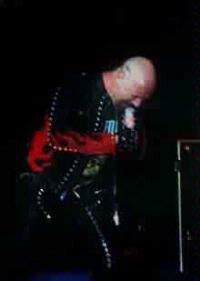 Shaven-pated and encrusted in studded black and red leather, Halford stalked the stage like a predatory beast. He definitely looked meaner than the last time I saw him. Well, this is a brutal new millennium and even a God must adapt to the times. You could have knocked me over with a feather duster when the band tore into the title track from the old Priest chestnut "Stained Class". I'll bet it's been 20 years plus since that one's been played live but Rob tore into it with no rust whatsoever. 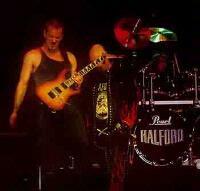 We then got a great rendition of "The Hellion/Electric Eye/Riding on the Wind" which blew all away. 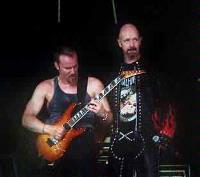 Halford's piercing shrieks on 'Riding on the Wind" were beyond description. Even with 2 brilliant vocalists like Geoff Tate and Bruce Dickinson also playing tonight, Halford proved his vocal supremacy. The new solo stuff got a pretty cursory tryout. "Cyberworld" is quite good and in the 'Electric Eye' mode but "Nightfall" is definitely on the average side. Why didn't we hear the awesome title track to "Resurrection"? And wouldn't it have been cool to have Dickinson come out and do the duet with Rob on "The One You Love to Hate' just like on the record? A viciously short set wrapped up with a crowd-pleasing "Breaking the Law" and another surprise, "Tyrant". I know these guys were the opening band but I sure would have loved to hear "The Ripper", "Rapid Fire/Metal Gods", "Screaming for Vengeance", and many more. Editor's Note: The photos accompanying this review were actually taken in Scranton, PA.